My first polymer covered eggs. I have always loved eggs. I love the way they sit in the palm of my hand, their curvature, and the new beginnings they represent. Humans have collected and decorated eggs for centuries, if not Millennia. I made my first polymer-covered eggs about 10 years ago when I organized a swap over the internet. These are some of the eggs I made. I started covering eggs again a couple of years ago when I developed a new way to use metallic (pearlescent) clay to produce relatively large patterned surfaces with surprising depth and luminosity. 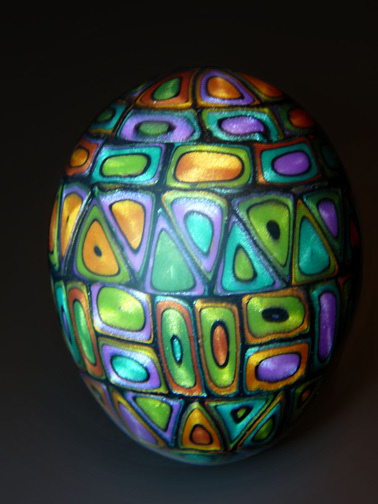 I discovered eggs made ideal canvasses for for the patterned sheets because they can display a relatively large pattern and their elegant curvature enhances the reflective properties of the clay. Now, I teach a class based on the technique and call it “Jeweled Eggs and Beads” because the technique worked equally well for beads (and buttons). The necklace shown on the right was selected as a finalist in a violet-orange-green color challenge in a jewelry magazine. 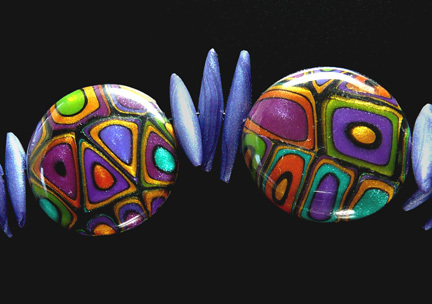 Just recently, I started covering eggs again using patterned canes because some of my students wanted a second caning class after learning to make the kaleidoscope pendant designs. I made this egg as a class sample. This entry was posted in Caning, Classes/Workshops, Kaleidoscopes, Metallic Clay and tagged 'jeweled' eggs, Carol Simmons, Color, Color Mixing, decorated eggs, egg art, eggs, Kaleidoscope Canes, polymer clay, Polymer Clay Classes, Polymer Clay Colorado, Polymer Clay Teachers, Polymer Clay Techniques, Polymer Clay Workshops, polymer covered eggs. Bookmark the permalink. The luminosity on those beads and eggs is beautiful. It’s something so different! It looks like metallic paint. Thanks for sharing. 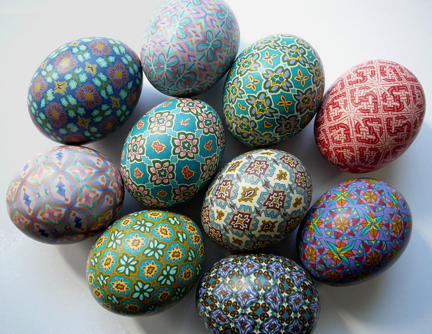 These are beautiful eggs! I love your kaleidoscope canes…they are awesome! Love the metallic mod cane ones…very striking! Dazzling!!! I never thought I wanted to cover eggs til now. These eggs are amazing! I don’t know anything about polymer but your eggs made me want to find out how they’re made. I can tell you this – is is really fun! I SO! want to learn how you get this effect. There are no guilds in Missouri that I’ve found. In fact, I’m the only one I know that plays with p.c. How can I learn your techniques? I do get PolymerCafe. Thanks for the inspiration! I was born in Kansas City. Wish I could be there, but I live down I-70 clear on the other side of the state. Not to whine, but on disability, ($693 a month,) and no vehicle. Do you have the date & class fee? There’s Amtrak! I don’t actually have one scheduled. I see there is a new guild in St. Louis. Thanks! I’ll try to find it. Do you get the luminosity with Mica Shift? Have you ever checked out http://www.ostrich.com? Great prices & quality on shells & stands. Thank you for the link Lynnelle! Thank you so much for sharing! I hope to eventually learn how to do this. Thank you for the compliment, Jamie. You are welcome to link to my site.